Update - error found and fixed. Agreement of 2nd recon below is now good. I have now posted three "elementary" emulations of Marcott et al. Each, in its own way, was a year by year average (here, here, and here). As such, it missed the distinctive feature of Marcott et al, which was the smoothing produced by Mante Carlo modelling of the dating uncertainty. So here I am trying to grapple with that. A story - I used to share a computer system with a group of statisticians. It worked well (for me) for a while - they used Genstat, GLIM etc - no big computing. But then some developed an enthusiasm for Monte Carlo modelling. I've had an aversion to it since. So here, I try to use exact probability integrals instead. There are clearly big benefits in computing time. Marcott et al had to scale their MC back to 1000 repetitions for the Science article, and I'm sure they have big computers. My program takes a few seconds. 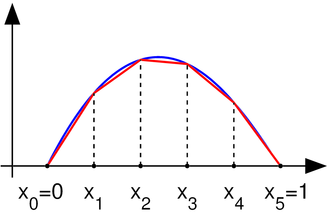 where Φ is the cumulative distribution function. MC modelling means basically evaluating that integral by the Monte Carlo method. For high dimensionality this is a good alternative, but if the variables separate to give integrals in one or few variables, MC is very inefficient. The data consists of a set of proxies calibrated to temperature. There is uncertainty associated with the temperature calibration, and of course there is general variability which will ensure that no reconstruction is exactly fitted; this is modelled as residual noise. For the purpose of calculating the mean recon, these added stochastic variables will in a Monte Carlo converge to their mean, which is zero. So they needn't be included. The variable that is important is the age (date) uncertainty. This arises from various things - the mixing of material of different ages that may have occurred; reservoir times, meaning that the proxy material may not have actually reached the sampling site for some years, and uncertainty in the actual dating, which is mostly based on Carbon 14. In a post a few days ago, I described how an interpolated function can be described as the product of data values with triangle basis functions. That will be used here. The date uncertainty becomes a stochastic translation of the basis functions. As mentioned above, if the analytic integral approach is to succeed, it will be desirable to partition the variation into items affected by a single (ideally) independent random variable. 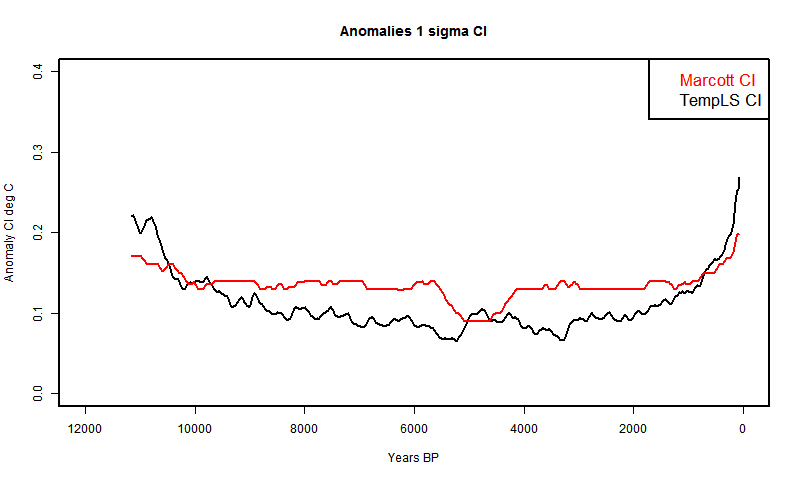 In fact, for dating an obvious candidate would be the C14 point uncertainty, which affects the data ages through the age model construction. I could not see how to actually do this, and Marcott et al give individual age uncertainties to the data points, as well as C14 uncertainties. Furthermore the data uncertainties are much higher than they would have inherited by interpolation from the C14 points, so I assume other sources of uncertaintyt are included. Still one would not expect the data points to vary independently, but no other information is given. I came to believe that Marcott et al did vary them independently, and in terms of the amount of smoothing that results, it may not matter. where f(e) is the unit normal probability density function (Gaussian). The limits of the integral are determined by B being between 1 and 0. There is a wrinkle here - both t0 and t1 have error, and you might expect that to be reflected in the difference dt. 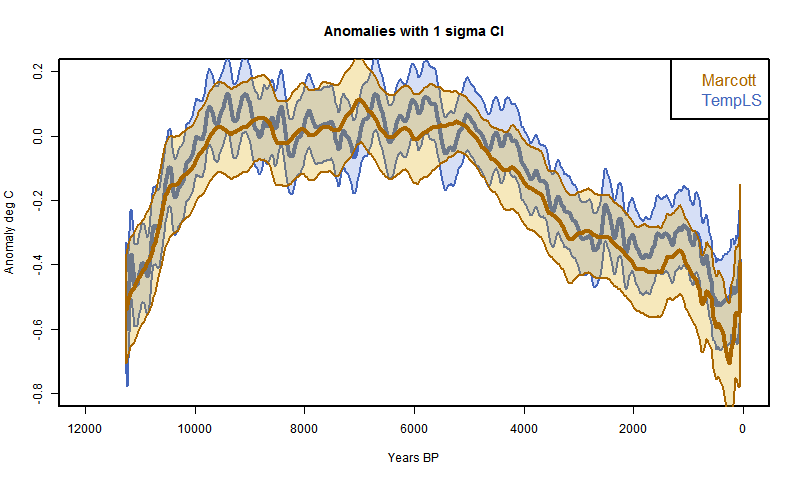 If the error in t1 were independent, then t1 might easily become less than t0 - ie data points would get out of order. However, with age model uncertainty that won't happen; the interpolated data ages will just slide along in parallel, and dt will not vary much at all. So I thought that a much more reasonable assumption is that B can translate, but not contract. As mentioned, I sum two parts of the basis on each interval, to make up a linear interpolate. The algebra all works if t0 and t1 are interchanged. 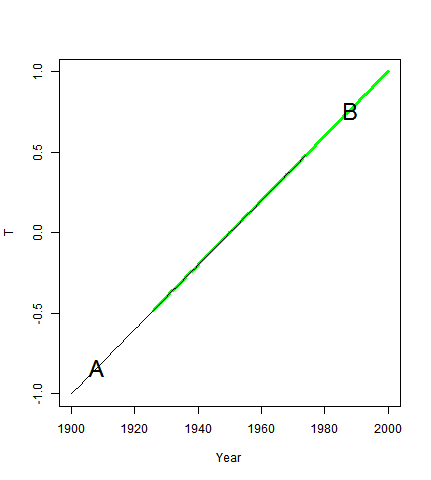 where Φ is the cumulative normal. 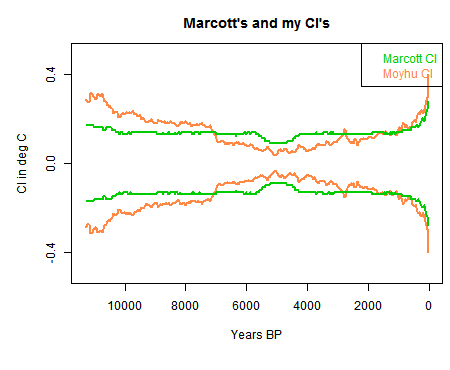 The time values t are Marcott's 20 year intervals, going back from 1940 (10BP) to 11290BP. So this process of smoothed basis functions effects the interpolation on to those points, on which the different proxies are then aggregated. The operation of this integral process is like gaussian smoothing, except that s changes from point to point. So some notion is needed of values beyond the range of proxy data, if it does not extend the full range. This is indeed the bugbear of the analysis. My first inclination was just to extend the first and last values, although I did not let them go to negative ages BP. That worked fairly well, as I shall show. My first recon was much as described here, but with the date process above added. The 73 proxies were located in 5x5° lat/lon cells. Time data at the 20-year intervals was calculated for each proxy. Then cell averages were computed, and then an area-weighted mean (allowing for latitude variation of cell area). At each time point, of course, only the proxies with data are included in the sum, and the weights are adjusted at each 20yr point to allow for missing proxies. It's mostly quite a good fit, and clearly has about the right degree of smoothing. 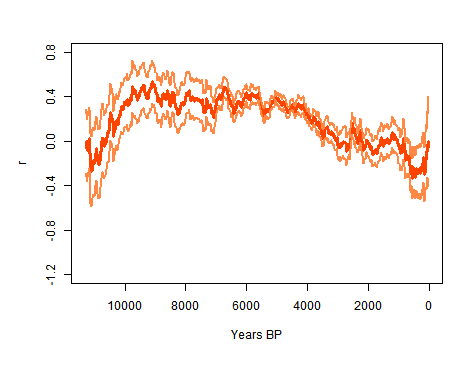 But it diverges somewhat in early Holocene and much more close to present. This is likely to be due to proxies coming to data endpoints, so I thought a more thorough treatment was required. So I looked more carefully at what would happen in a Monte Carlo near data endpoints. At the start, the first age point moves back and forth, so that some of the 20-yr points are sometimes in and sometimes out of the data range. That implies a change in the cross-proxy weighting. When that proxy is considered missing, it's weight goes to zero and other weights rise (to add to 1). That's bad news for my method, which tries to keep the effect of the random variables isolated to a single proxy data point. This would spread its effect right across. However, there is another way of allowing for missing data in an average which I find useful. You get exactly the same result if you don't change the weights but replacing the missing value with the (weighted) average of the remaining points. Then the weights don't need to change. The problem is, we don't have that value yet; we're doing the proxies one by one. The solution is, iteration. The ending proxy is just one of at least fifty. It doesn't make that much difference to the aggregate. If we substitute the numbers from the first recon, say, then the second time around we'll have a much more accurate value. A third iteration is not needed. There is a subtlety here where there are several in a cell. Then when one goes missing, it should be replaced by the cell average. It is only when the proxy was alone in a cell, that it should be replaced by the recon average when it goes missing. The test is always, what value should it have so that the aggregate would be the same as if the remainder were averaged without it. I had previously made an error with the cell area weighting, which affected this plot. Now fixed. It's much better at the start. In fact, it even almost reproduces Marcott's non-robust 1940 spike (well, after fixing a start problem, it's now a 1900 spike followed by a dive). I fixed a problem at the early end, so that I now use data beyond the end where available in the integral, as Marcott seems to have done with Monte Carlo. So agreement is good there too.. This might be old news - my automatic system had again stopped automatically checking GISS. Anyway GISS LOTI went from 0.49°C in February to 0.59°C in March. Most other measures were fairly steady. Maps below. This viewer is similar to that for the Marcott proxies. 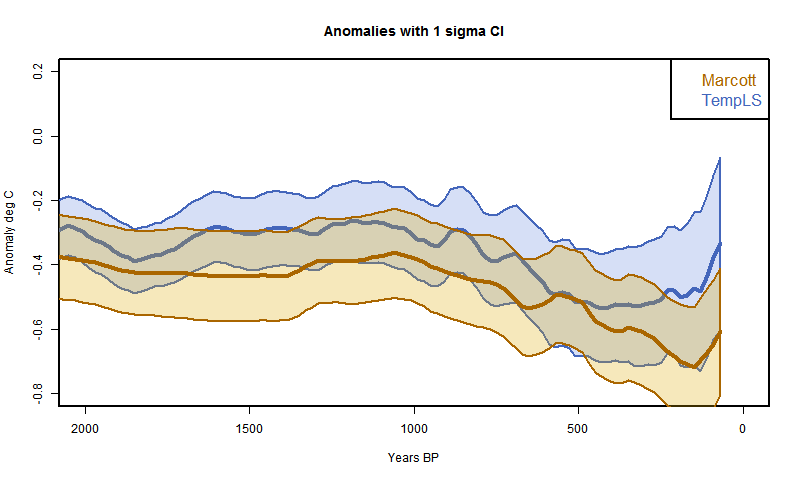 It covers the very well presented online data for the new Nature Geosciences paper Continental-scale temperature variability during the past two millennia. Because of the large number of proxies, there are now several different key tables. Each starts with continental regions in black, and you can click on any of these to move to that selection. It may take a few seconds for the new key to appear. Then you can click on any proxy to superimpose a black plot on the background spaghetti plot for that region. The metadata from the online data will show top right, and the location on the map. The spaghetti plot shows the proxies smoothed with a 21-year moving average filter, and normalized to mean zero, standard deviation 1, over their respective periods. When you select a proxy, it shows the curve in black similarly smoothed and scaled, but the y axis is marked in the appropriate unit. Also shown is the unsmoothed plot in a grey transparent color. Low resolution data has been linearly interpolated. The swap button allows a blink comparison between the last two proxies selected. These can be from different regions. Update. I have added a search facility. Above the map there is a text box and a search button. You can enter any text (like "d18"), click the button, and little arrow marks will appear beside each proxy which has that phrase in the metadata. So you can search for types, authors etc. The arrows are cleared before each search, so if you want them to go away, do an unsuccessful search. It actually searches the underlying HTML, which may give a false positive. I have now posted three simplified emulations of the Marcott et al reconstruction, here, here, and here. Each used what I believed to be their assumptions, and I got comparable means and CI's. And I think the Marcott assumptions are fairly orthodox in the field. But I've been wondering about the noise structure, and in particularly the effect of the extensive interpolation used. 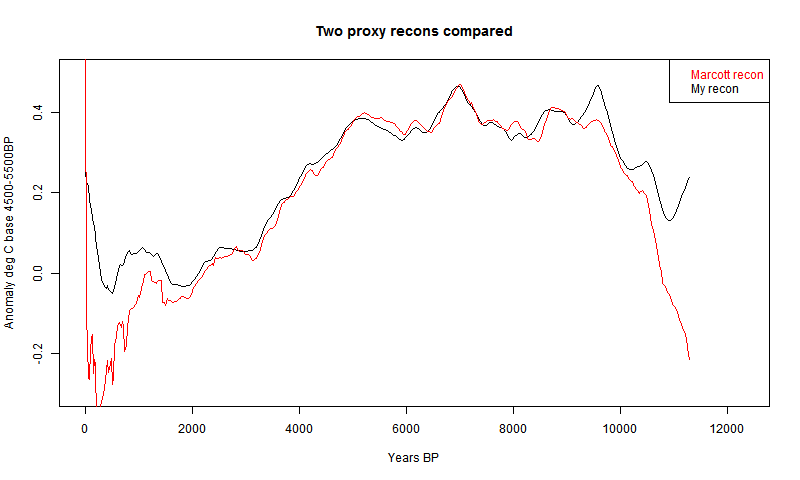 The proxies typically have century+ resolution, and are interpolated to twenty year intervals. The interpolated points are treated as independent random variables. They have about the same uncertainty (amplitude) as data points. But they are certainly not independent. I find it useful to think about interpolation in association with the triangular basis (shape) functions of the finite element method. I'll talk about those, and about the kind of linear model approach to reconstruction that I described in my last post. Below the jump. A major elegance of the finite element method is that you can then switch attention to the elements (intervals) and assemble the result (interpolate) by operating on the fractions of the basis functions that lie with ine element. 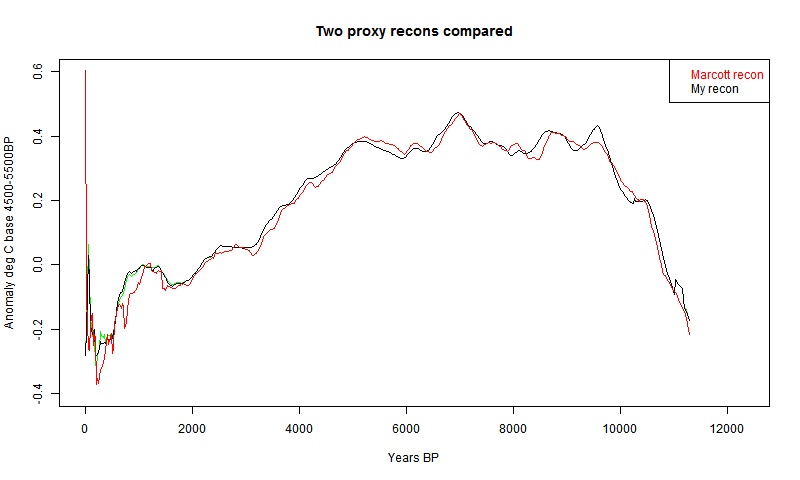 where Tt is the global temperature function being sought and Pp are offsets associated with each proxy (index p). 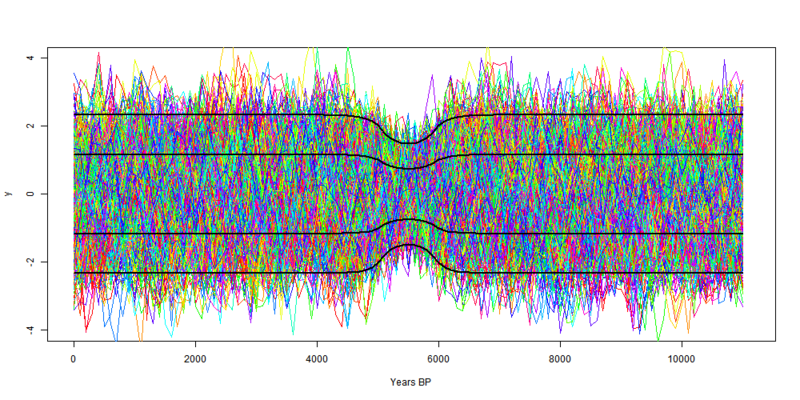 When I did that, the data points were interpolated to 20-year intervals, and that was the spacing of t. So there were 565 Tt parameters over 11300 years. That's the linear interpolate; the Tt are still the parameters we're looking for by fitting. In principle, I believe you should enter just one equation for each data point, which gives a reasonable chance that the residuals are independent. But how to make that equation? That looks like potentially a large sum. 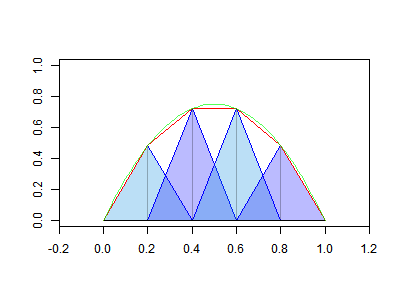 However, only two at most basis functions overlap s, so only two of the T coefficients are implicitly involved. However, that would give low weighting in the equation system to proxies that had sparse data values. They may not deserve that, because the data value may be representative of a longer interval. In many cases, sparse proxies are so because it was decided that there just wasn't much point in expressing numbers at finer resolution; they just don't change enough. 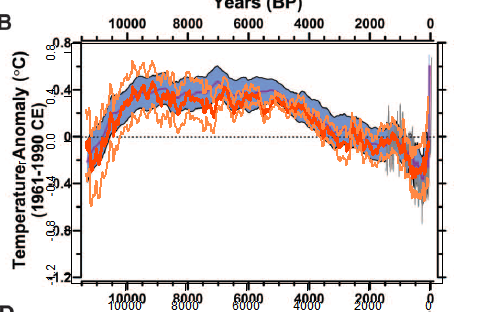 The extreme alternative view is to say that the data point is representative of the interval up to the next point. That's really what is assumed when the data is linearly interpolated. In our terms the data point represents a contribution measured by its product with its basis function. by that same basis function Bs(τ) and integrating. The integration is in principle over all time, but the basis function is only non-zero on the intervals adjacent to s.
I'm currently trying to implement the Galerkin method. The results are noisy, and I'm not sure if I'm getting it right. I'll report. 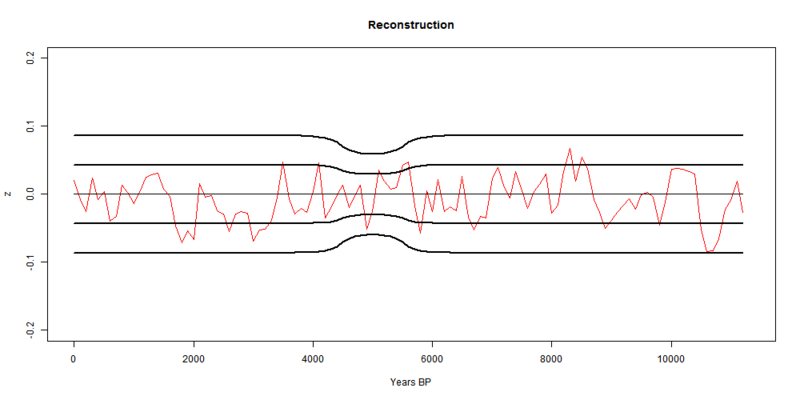 In the previous post, I described the use of TempLS to fit a reconstruction of temperatures during the Holocene, using the data of Marcott et al 2013. It's actually a rather smaller problem that TempLS normally handles, and can be done by the R package biglm. So I wrote a simpler version for which I can supply code. has way more equations than variables, but a least squares solution can be found by regression (biglm). The results are very similar to the TempLS results; the CI's are those from biglm. Details below the jump. Plots have been added. In the lm() formula y~x, y is the listing of all interpolated proxy temperatures; there are about 30000 of them. The x matrix of variables is basically an incidence matrix (no weighting is done in this simple program, but a weight vector could be supplied). There are 565 columns for each time step (20 yrs) and 73 columns for the proxy. Each row has a 1 in the column for time and 1 in the column for proxy. The program consists of compiling this, running biglm, and from the summary using the coefficients and se's to make the plots as in the previous post.. I won't repeat the diagrams, they are very similar to the previous post. The code and data (prox.sav) and plots are in this zipfile. 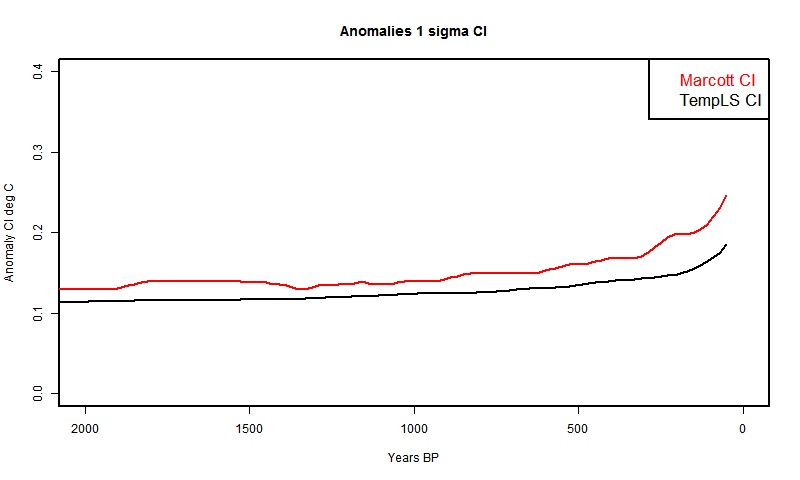 And here is the plot with just the CI's for comparison. Here are versions restricted to the last two millenia. TempLS is a program I wrote for getting global average surface temperature anomalies. I've been using it every month to calculate an index from GHCN/ERSST data, which I compare with GISS when it comes out. It differs from those usually used in that it associates offsets with stations and does a least squares fit, so avoids fittinga fixed anomaly period into station data. The math basis is described here. And here is a somewhat dated overview. I've been in discussion at Lucia's (see also recent threads here), and it seemed to me that a method she was proposing for anomaly reconstruction for paleo could be implemented in TempLS. Although TempLS is oriented toward monthly data with seasons, it can fix on just one month of the year, so all I had to do was get data in the right input format. As with my earlier recons, I did not attempt the Monte Carlo variation of dating and calibration. I used the published dating. It works quite well - I'll show early results below. It avoids the dimple. I use the same 5x5 weighting scheme. However TempLS has extensive facilities for weighting by different methods, such as unstructured triangular meshes, which are well suited for sparse sets like these. The Marcott et al data comes from the Supplementary Materials spreadsheet. In these plots I have shifted all curves to a 4500 to 5500 BP anomaly base for plotting. However, I am using the Marcott et al CI's as from the spreadsheet, and the TempLS calc did not use this period, so I did not modify the CI's to reflect this shift. I smoothed all data using a century moving average. This cuts 40 years off each end. The reason I smoothed the Marcott data is that it is given to only two significant figures, so is whiskery when plotted unsmoothed. 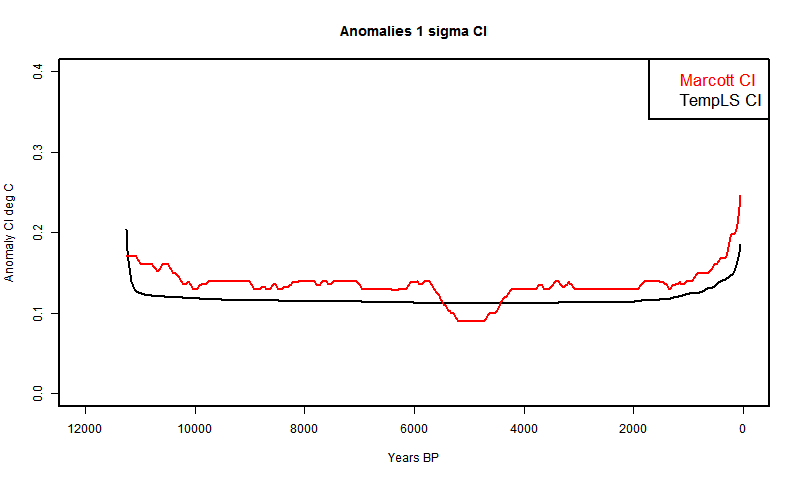 Here is the plot over the full period with the TempLS and Marcott reconstruction with shaded CI's. One thing to note is that the TempLS solution is dimple-free. The overlap is fairly good - TempLS strays a bit at the ends. I'm checking for possible reasons. 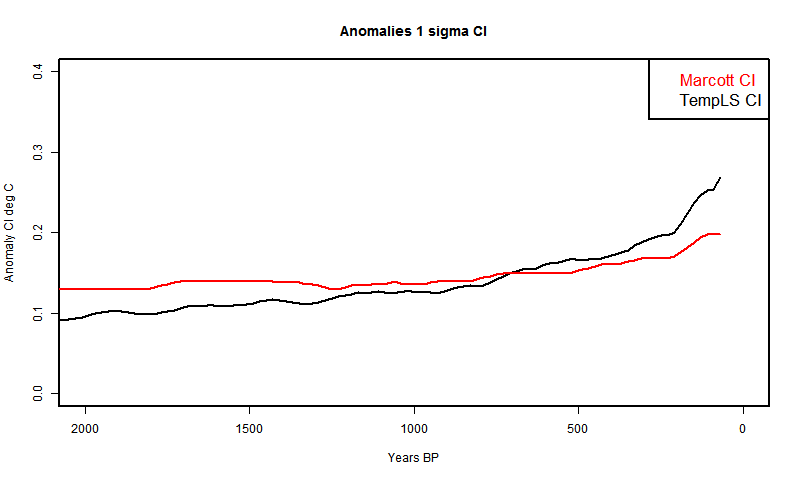 And here is the plot with just the CI's for comparison. TempLS is mostly lower, but again does not include error due to calibration and dating uncertainty. +- sqrt(DKD*) where D is a simple matrix which implements the mean subtraction step of anomaly formation and K is the covariance matrix of the time sequence residuals. I have now applied this to the case of AR(1) residuals. This gives a pattern similar to the Marcott case discussed at Climate Audit. There's a bonus in that fitting the shape gives an estimate of the AR(1) lag factor. The scale is reversed, but it is symmetric. I think both the shape and depth of the dip match fairly well for r=0.6. The function is like a cosh in the base, then asymptotes exponential to the far field. In this post, I've stripped the mathematics down to just a noise model AR(1). I should review how that relates to a proxy reconstruction. I've drawn 700 realizations of that noise in the plot. You could think of a toy recon in which 700 proxies around the world, some hot, some cold have a fixed base temperature, with one of those noise realisations added. So we'll make a reconstruction from these. We take anomnalies (using D). This strips out the varying fixed base temperatures, and leaves 700 realisations of anomalised noise, which will each have the CI's shown here. 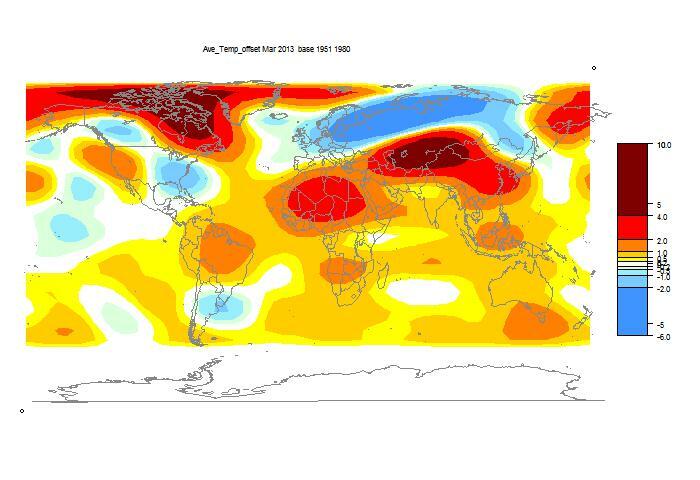 The TempLS monthly anomaly for March 2013 was 0.396°C, down slightly from 0.447° in February. I had actually reported a small decrease from Jan to Feb which with more data was converted to a small rise. Satellite indices also show little change, after a bumpy few months. Europe and N Russia very cold, central Asia very warm. 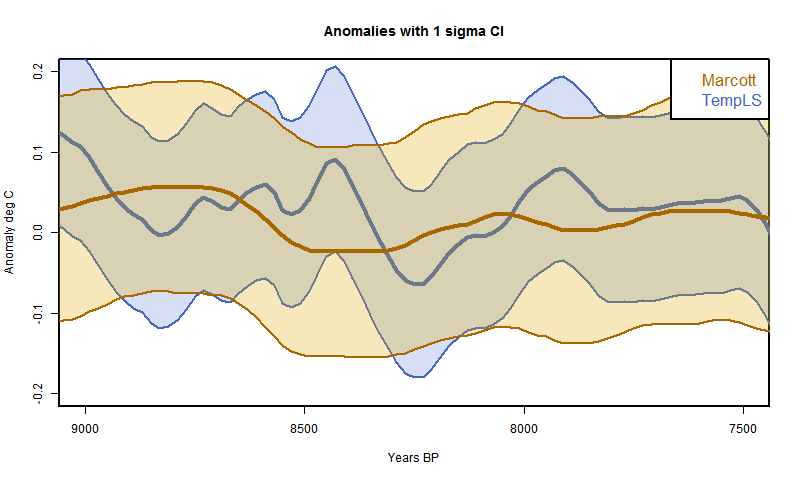 Prof Lonnie Thompson and colleagues have a new paper in Science Express called "Annually Resolved Ice Core Records of Tropical Climate Variability Over the Past 1800 Years". With annual resolution it becomes worthwhile to compare with measured surface temperatures. I did this with TempLS, using GHCN/ERSST and restricting to an area 1000 km around the location of the Quelccaya site in Peru. The Quelccaya data is here. This is done partly in response to a thread at Climate Audit, where there was speculation about the possible relationship of the d18O proxy to surface temperature. The standard TempLS analysis is below the step. The analysis runs from 1900 to 2009. Since Thompson uses the "thermal year" starting for SH in July, I have followed that convention. So what is marked as 2009 is actually Jul 2009-Jun 2010. Here is a map of all the GHCN/ERSST stations within the radius. 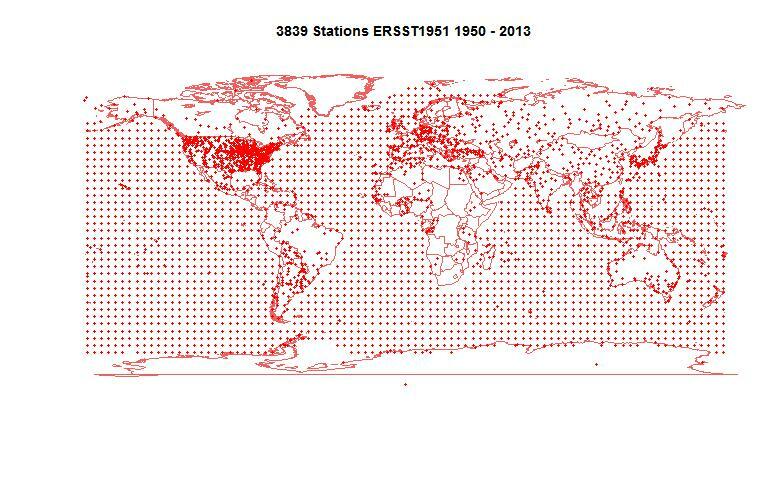 ERSST "stations" are the 5x5 lat/lon grid points of the data. 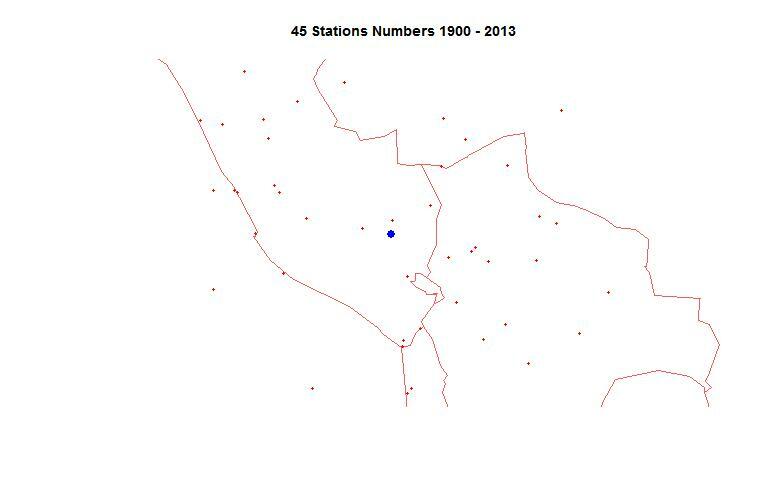 The map includes all stations that have reported from 1900-2013, many for only short times. The Quelccaya site is shown with a big blue dot. Finally, here is the plot of surface temperatures (black) vs Quelccaya d18O. 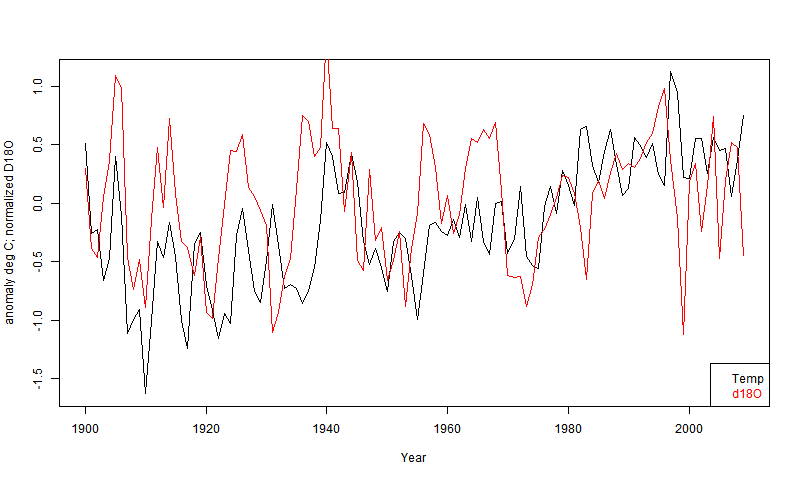 I normalised the d180 data by matching the mean and sd over base 1961-90 to the temperature measure. Note that the scaling is not to be relied on as I did it by matching. 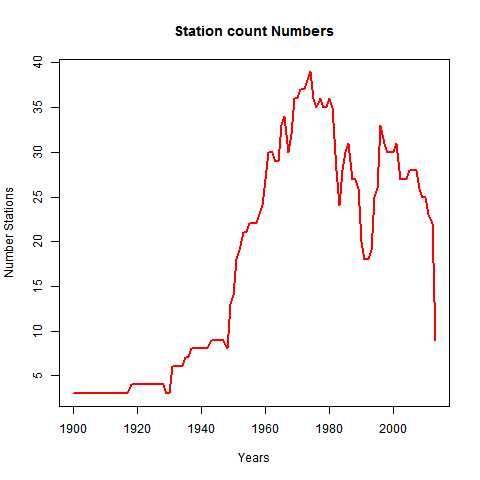 For the first fifty years (with rather small station numbers), there are indications of correlation, but some sranger things recently. 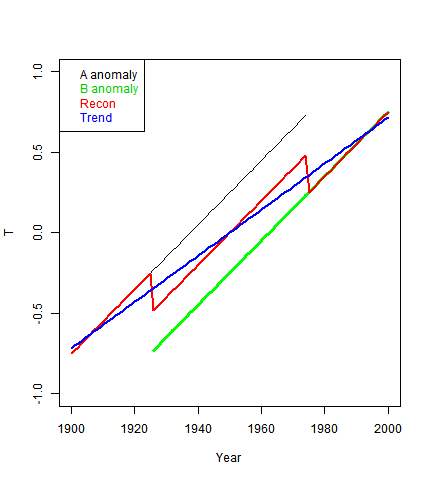 The big dip in 1999 in d18O does not seem related to this measure of local temperature. However land temperatures were actually cold, but the 1000 km radius picks up a lot of ocean, which was warm.